You may have noticed that my blog tends to feature minibeasts. But rarely will you find a spider, because I am quite simply scared stiff of them. I know, pathetic. But perhaps I wouldn’t mind them so much if they all looked like this one. This is a common crab spider, misumena vatia. They hang out on flowers in gardens in southern England. They are clever, because I have noticed that they favour the more scented blooms, maximising the chance of some hapless insect happening by. They come in white or yellow, which I much prefer to brown or black. But they still have too many legs. 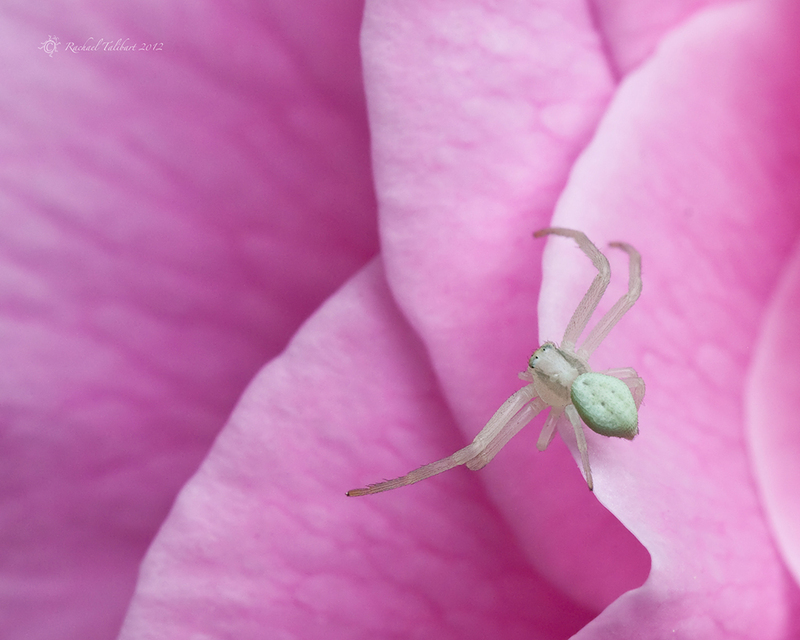 This entry was posted in garden, nature, photography and tagged common crab spider, England, garden, macro, misumena vatia, photograph, photography, rose, spider by Rachael. Bookmark the permalink. Lovely shot. I completely know how you feel. As you might remember, I too am pathetically afraid of spiders. ahhh! Now I’m going to think of that! haha. Although, I pretty much already did. I hate the little guys. Ooh, looks very much like the one I saw today crawling on a sunflower leaf. Could be. Did you photograph it? My two remove eight-legged freaks for me too. I am relieved that I haven’t passed on my fear to them. It’s so strange, I keep well clear of the big, hairy black ones but I’ve noticed these pretty white ones in the flowers and I thought they were cute. I’m glad you like them too! Great photo, as usual. Thank you. Crab spiders are pretty but they do move very fast and unpredictably. Something that creeps me out in all spiders, even pretty ones. Beautiful photo. Loving the contrasting colours. The little critter stands out perfectly. Thing with spiders is that they’re unpredictable. They could stay still, or move quickly TOWARDS YOU! That’s the worst thing about photographing spiders. I agree! These little crab spiders are very fast. When I was a kid in Oklahoma, I had no problem with *big* spiders. Tarantulas made sense to me. You could read them. They were (usually) slow and deliberative. They’d let you know if they were pissed by locking into a defensive position. You could indeed read them, just like a snake. It was the little spiders that creeped me out. The ones that could be shoes, waiting for my delicate, soft, child toes. The evil little spiders waiting en masse to destroy those soft areas between my toes. Heh. Eventually, the fear faded away. I am, however, still absolutely terrified of scorpions. They creep me the hell out. Minibeasts, indeed! Well you have a right to be wary as some of the spiders and other critters in your locale can actually do you harm! Me, I am just a wimp. None of our spiders can hurt a human and we don’t have scorpions.